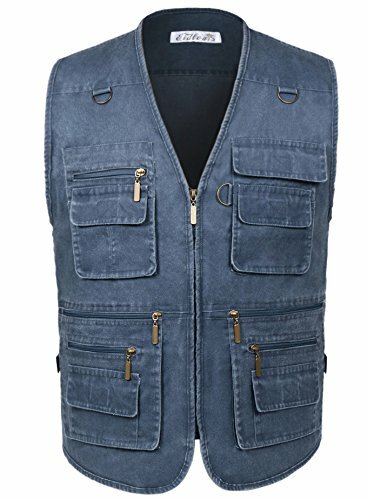 3.Because the vest was produced by Chinese garment factory, the zipper on left side.If you couldn't accept,please DON'T buy the vest. Size M: Chest: 41 inch, Shoulder: 17 inch, Length: 26 inch. Size L: Chest: 46 inch, Shoulder: 18 inch, Length: 28 inch. Size XL: Chest: 51 inch, Shoulder: 19 inch, Length: 29 inch. Size XXL: Chest: 53 inch, Shoulder: 21 inch, Length: 31 inch. 1.16 pockets are well placed and zipper is smooth. 1.35% cotton & 65% Polyester. If you have any questions about this product by Eidlvais, contact us by completing and submitting the form below. If you are looking for a specif part number, please include it with your message.